The general public shall eventually understand that the retired Deputy Governor (DG) is more of an economic hit-man than an economist. Someone who massively benefits from public funds, with pension of Rs. 5 lakhs or more per month, huge retirements benefits (in excess of Rs. 50 million) and lifetime luxurious healthcare benefits funded by the public while their children live comfortably in developed countries criticises the welfare policies of helping the poor and blame us for non-implementation of policies propagated by the IMF and World Bank. Understanding that there are no countries developed because of the advice of those institutions, I as the Finance Minister negotiated with them to change their policies to suit our economy. The retired DG continue to erroneously interpret the actions, taken in the best interest of the citizens and to uplift the living standards of especially the poor and lower middle class. The hidden objective behind this continues attack of the advisors and inner circle of the current Finance Minister including the retired DG is to discredit me saying I am responsible for the ongoing economic crisis. Government revenue in 2014 was 10.6% of GDP. We had huge debt obligations to repay in 2015. We had offered a large salary increase to public servants. Fiscal expenditure had ballooned. During my tenure, we started sweeping changes in revenue collecting institutions to get the best. By the time of my departure from the Finance Ministry, revenue had increased to 14.9% of GDP, but since then it has descended to an estimated 13.4% of GDP. Numbers are self-explanatory. The economy went into this sorry status because of impractical and outdated advice given to the present Finance Minister by his inner circle with a hidden business agenda. I should remind that the economy contracted in 2001 while the same advisors were holding high posts. That is more than enough to judge their track record. While I will certainly address and answer to the unwarranted, hated and disparaging criticism in the future, I should expose the main reason for his behaviour of attacking me. The investigation on the issuance of Treasury bond issuances via private placements to private parties during the period from 2008-2016 commenced while I was serving the Minister of Finance seems to have angered the retired DG. Under the powers vested upon the Minister in charge of the subject of Finance by the Monetary Law Act, I requested the Auditor General to initiate an audit inquiry into Treasury bond (T-bond) issuances during the said period and provide a comprehensive report. The findings of the report presented by the Auditor General highlighted that the issuance process of T- bonds via private placements to the private sector had been carried out without the due approvals from the Monetary Board (MB). The above erroneous practice of issuing T-bonds via private placements without proper approval from the Monetary Board to the private sector began while W.A. Wijewardena was serving as the Deputy Governor in charge of the public debt function. According to the information from the Presidential Commission and financial analysts, who had presented information to the President, the loss to the State from the corrupt and flawed practice was in excess of Rs. 1,000 billion. This individual, who appears to be a proponent of good governance, was the DG in charge of both the Employees’ Provident Fund (EPF) and the Public Debt Department (PDD). But, this individual never considered the conflict of interest when he supervised the two departments. Being the DG in charge of both the EPF and the PDD, he introduced a fraudulent practice of private placements, which paved the way for a few private businessmen to misuse public funds such as EPF, belonging to the working class of the country. I tried to expose the individuals behind this deceitful act of defrauding the money belonging to the working class through the above investigation. It is not surprising why some Central Bankers along with said retired DG and private businessmen who made billons of profits from the unauthorised private placements in T-bonds want to defame me. They knew if I remained as the Minister of Finance any longer, their masks would be unveiled. It was in their best interest to remove me. They are behind the shameful and unsubstantiated media attack unleashed on me and conspiracy to remove me from the position of Finance Minister by linking up my name to the T-bond issues in 2015 and 2016 though I have no involvement whatsoever in any of the above bond issues. They wanted to remove me for their survival, they used the political environment that prevailed at that time to create a serious conflict between the President and Prime Minister. As a mature politician, I understood the repercussion of such a conflict and decided to resign from my ministerial portfolio for the sake of party and the country. What have these economists done for the past two years? The economy went into total dilapidation day by day and they continue to blame me for their mistakes. As a politician elected by the people, my duty is towards my people. I should expose the real culprits who destroy the Central Bank and our economy. Private placements to private parties were carried out without proper approval from the Monetary Board (MB). The approval had been obtained only to issue private placements to EPF, ETF and NSB for the yield rates approved by the MB till end of December 2008, but no approval was given to issue private placements to anyone else other than EPF, ETF and NSB (please refer the attached Board Paper). The Operation Manual used by the PDD was not approved by the Monetary Board or by any other institution having such authority. In the Operation Manual, decision making power on yield rate for private placements of T-bonds delegates to Head of PDD. (This is viewed as the lowest rank in the senior management of the bank.) In the case of T-bond auctions this decision is taken by the Tender Committee, chaired by a Deputy Governor while few Assistant Governors and Heads of Departments of the Central Bank serve as members. The important question here is, who made the decision to delegate this very important economic decision to Head of PDD (a lower ranked person) through the Operation Manual? After a particular auction not only T-bonds relating to the said auction, other T-bonds previously issued has also been made available to purchase via private placements. The Monetary Board had, by its decision dated 7 October 2008, granted approval for the issue T-bonds through private placements to captive sources such as EPF by adding five basis points to the market rate. It was observed that 99% of the total value of bonds issued during 2008 to 2015 were issued at rates outside the above approved rates and T-bonds were issued to the private sector violating the above decision. W.A. 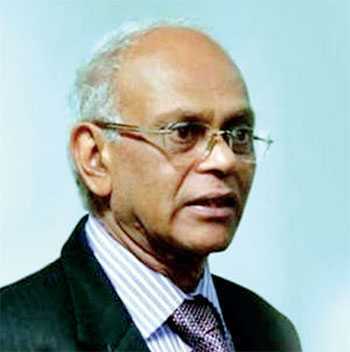 Wijewardena, who questions the governance and ethical conducts of others, established the above erroneous practices as the Deputy Governor in charge of public debt function and never try to rectify the lapse in internal control system and improve the governance in issuance of T-bond through private placements, allowing several private businessmen in the Government securities market to make billions at the expense of the State. Let’s pause here for a while to understand the purpose of introduction of issuing Treasury bonds. Prior to the introduction of T-bonds in 1997, primary local debt instruments were Treasury Bills (shorter tenure) and rupee Loans (medium to longer tenure). Financial features of T-bonds and rupee loans were identical in many aspects except the issuing mechanism via auction system and marketability of T-bonds. If T-bonds are issued through a private placement there is no difference between rupee loans and T-bonds. The private placement practice contravened the purpose of introducing T-bonds. The PDD through the above memo informed the Monetary Board that the rest of the funding requirement is mobilised from non-captive sources by issuing T-bonds and T-bills through auction process. The same memo explained to the board that as a result of this private placement, there is a possibility of having dual rate structure for similar maturities and possibility of mark-to-market losses for captive holders. Considering the reasons provided in the memo, the Monetary Board approved a temporary deviation from the practice of issuing Treasury bonds via public auctions, as originally approved in 1997, for a period of four months in order to mobilise part of borrowing requirements from EPF, ETF and NSB. In violating the above Monetary Board approvals, the Central Bank had issued Rs. 55 billion of worth of T-bonds to the private primary dealers in 2008 though Monetary Board approval was given to issue T-bonds only to EPF, ETF and NSB through the above mechanism. The Auditor General’s report revealed that 66% of the T-bonds issued through private placements are at yield rates above the prevailing market rates. W.A. 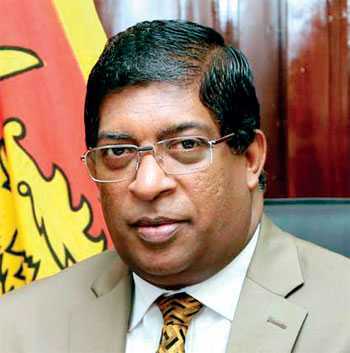 Wijewardena, the Deputy Governor in charge of public debt at that time, should answer the public under which authority he conducted those issuances. If a forensic audit is conducted for the period from 2008-2015 the loss to the State, EPF, ETF and NSB could be estimated accurately. 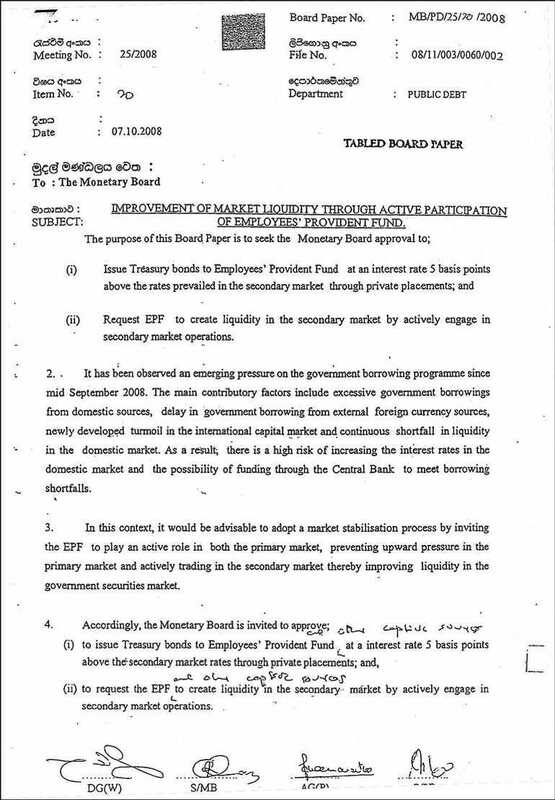 Wijewardena had altered the above Board paper in his own handwriting to include phrase “other captive sources” after the word ‘EPF’, apparently without knowledge of the originating party, the PDD. It raises reasonable doubt as an attempt to deliberately mislead the Monetary Board (please see the scanned copy of the Board paper). It is difficult to identify the exact definition of captive sources. No one knows why Wijewardena chose such a loosely-defined word without properly describing the institutions considered as captive sources. It is very clear through this Board paper that Wijewardena wanted EPF, ETF and other Government-controlled entities to force to trade Government securities in the secondary market to improve secondary market liquidity. This exposes how the PDD forced other institutions for their investment decisions. However, when the Government entities carried out trading in the Government securities market during 2015 and 2016 as he forced them to trade in 2008, Wijewardena took a U-turn and severely criticised. However, the above Board paper exposes the identity of the person who introduced secondary market trading in Government securities to these institutions. Again, not surprising at all, this is not the first time he contradicts his decisions. The Auditor General, observes the lapse of internal control and surpassing of internal controls prevailed at that time in the private placements. This indicates not only the internal controls were quite insufficient but also the process of issuing bonds via private placements had ignored the existing internal controls. The Presidential Commission also highlighted the lapse of internal control and surpassing of internal controls in the EPF. The report finds fault with the management of the EPF for not having a basic voice recording system, which is mandatory for any dealing room. Being an expert in governance and internal controls, though he was the DG in charge of public debt function for quite a substantial period, he didn’t install at least a basic voice recording system in the front office of the PDD and the EPF. While he was in office of DG supervising the public debt, the PDD commenced the practice of issuing T-bonds via private placements to the private sector. 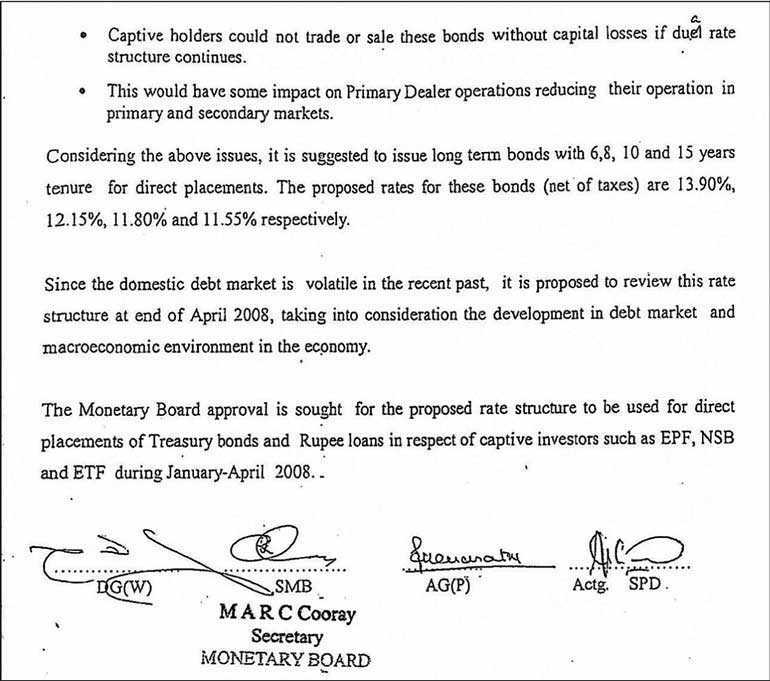 Also, the PDD requested EPF to trade in the secondary market aggressively to create a liquidity. Wijewardena should answer why he didn’t implement such internal controls during the period he served as the DG supervising both the EPF and the PDD. The practice of private placements continued for eight years till 2015 without proper controls and contrary to the objective of introducing T-bonds, causing massive losses to the State. The President has revealed the media the losses amount to Rs. 1,000 billion. As an accountant by profession, I understand that the unauthorised corrupt practice has produced colossal losses to the State in excess of billions of rupees. I will leave the disclosure of why and how these retired officials carried out unauthorised private placements of Treasury bonds to a future date. However, my intention as an elected politician was to bring out the truth, by uncovering the masks of so-called good governance activists. They are not real good governance activists, they appear to be so to cover up their corruption in the past when they were holding public office. They knew if I remain in the office their true face will be unveiled one day. But truth cannot be suppressed, it will come to the surface one day. It will happen soon.